The #5 Mustang Sampling Cadillac DPi-V.R. 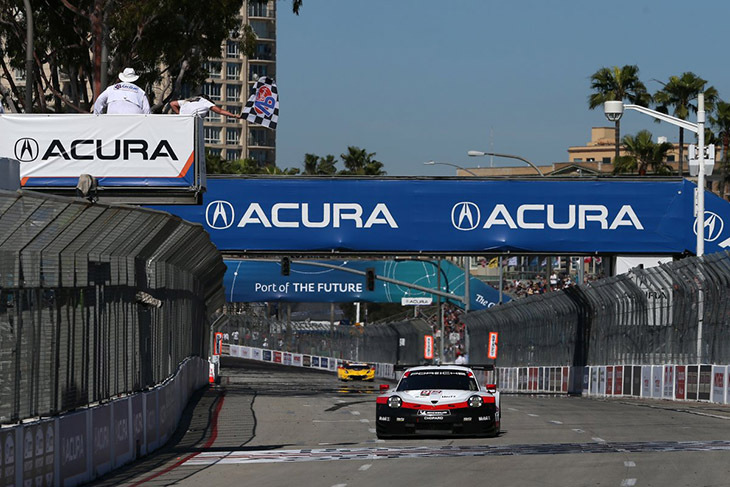 of Joao Barbosa and Filipe Albuquerque took home the win on the streets of Long Beach after Albuquerque defended a hard-charging #7 Acura ARX-05 DPi in the race’s waning minutes. “This was unbelievable, this was defiantly a team win. I had a terrible start, I tried to avoid chaos in the first turn and I really fell behind, we got into a good strategy, saved fuel, and we made a ton of positions on pitstops and on strategy. I’m really proud of these guys,” said Barbosa before making the walk to victory lane. Barbosa started the race from the fourth position but had a rough start as he mentioned. This saw the car drop towards the rear end of the DPi pack. Good work in the pits, combined with the misfortune of others in the field, meant that Albuquerque was in good position to make the best of the day for the crew who did well to stay out of trouble. Albuquerque was particularly masterful in the late stages of the race in dealing with the GT Le Mans traffic, often finding ways to squeeze a piece of GT-machinery between himself and the chasing Ricky Taylor in the #7 Acura. Taylor ended up bringing home the #7 Acura just .740 tenths of a second off the lead. The final step on the podium was taken by the #6 Acura Team Penske ARX-05, meaning Acura takes home the most points for the manufacture’s championship for this round. 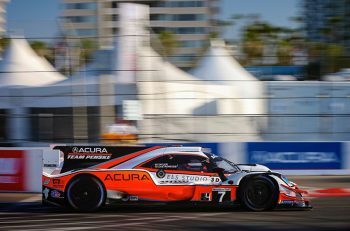 That is at least one positive that the team can take away from Long Beach after a weekend that perhaps saw more potential for the Acura crew after Helio Castroneves had put the #7 Acura on the pole. Mazda struggled in their de facto home race with the #77 Mazda RT-24P of Oliver Jarvis and Tristan Nunez coming home in fourth. That was by far the better performing of the two Mazda entries as the #55 Mazda RT-249 of Jonathon Bomarito and Harry Tincknell experienced a race they will be eager to forget. After Bomarito went off in qualifying that resulted in a chassis change, his weekend did not improve during the race. He had moved his #55 Mazda up to third before even getting to the fountain on the first lap of the race, but his aggression came back to bite him. He made contact with the #10 Cadillac and Jordan Taylor at Turn Eight in the race’s first five minutes. From there, the #55 Mazda was in and out of the pits as the car struggled for pace. A change of nose and driver as Harry Tincknell stepped in with one hour and fifteen minutes to go slowed the bleeding, but the damage had been done. The #55 Mazda finished the race eighth in class, fifteenth overall. One standout performance of the race, however, came from the #50 Juncos Racing Cadillac DPi-V.R. of Will Owen and Kyle Kaiser. The team elected not to pit with the rest of the DPi field under the race’s second Full Course Yellow, for a stalled #55 Mazda. With all cars still needing a second stop, Kaiser was the true race leader and even ran out to a two-second lead before pitting. Will Owen took over, but emerged within the GTLM field, costing the car a significant amount of time to the other DPi runners. The day got even worse when Owen made contact with the Turn Eight tyre barrier while battling for position late in the going. They finished seventh in class. 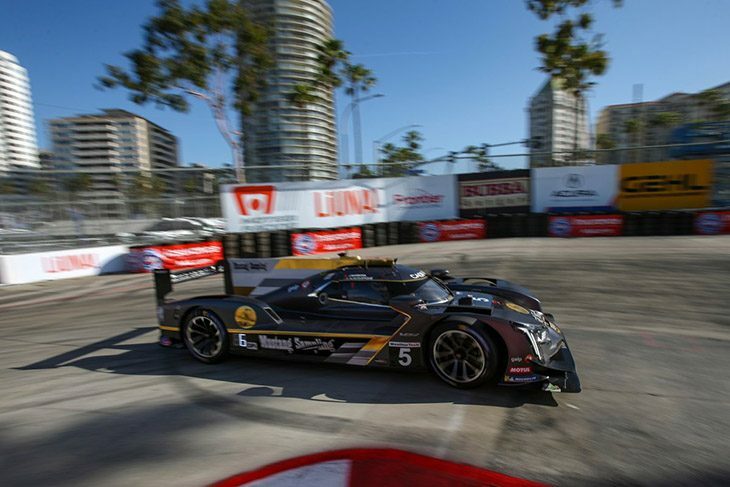 The #54 CORE Autosport Nissan DPi’s day came to a premature end when Jon Bennett made contact with a tyre barrier at the exit of turn six on the race’s first lap. The damage was too severe to be repaired, and the car became the race’s first retirement. There was no clear camera angle on the incident, but that area of the track has been a problem for many drivers this weekend including Jonathon Bomarito who ended up in a nearly identical spot in qualifying. 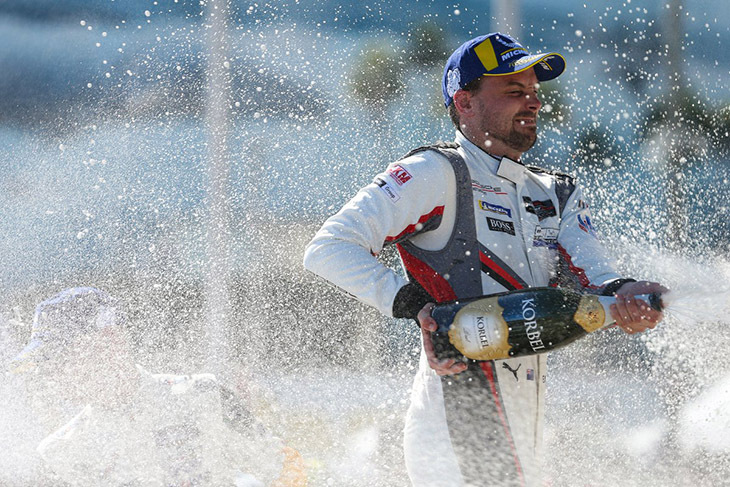 It was a dominating day for the #912 Porsche 911 RSR crew of Earl Bamber and Laurens Vanthoor after starting the race from the outside of the front row. Vanthoor started the car before handing it over to Bamber for the second half. Bamber would go on to make a pass for the lead on the #66 Ford GT of Dirk Mueller with 45 minutes remaining. 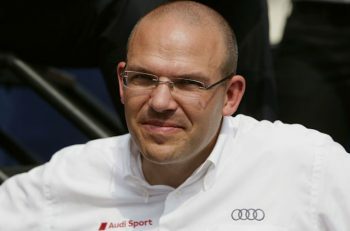 “Earl and myself [Vanthoor] get along super well, we are a good team. We have always had something go wrong when we are in a good position.” Said Vanthoor after the race. This win moves the #912 Porsche into the lead of the GTLM championship. The aforementioned #66 Ford, which was started by Sebastian Bourdais, moved into the lead in the middle of the race after a brilliant strategy call. The Chip Ganassi crew called Bourdais into the pits for their pitstop with one hour and seven minutes remaining. The team sent Mueller out, and a Full Course Yellow fell just seconds after the #66 Ford had left the pits. Mueller could not match the pace of the #912 Porsche and Bamber who got a great run out of the hairpin and made the pass on the run down to turn one. Despite a flapping rear diffusor on the Porsche causing late-drama, Bamber was able to maintain a strong enough pace, keep the lead, and eventually secure the win. Mueller would soon have other problems as the car ran out of fuel on the final lap of the race on the exit of Turn Eight. Jan Magnussen, who was in the #3 Corvette Racing C7.R, and who was following closely behind the #66 Ford slammed into the rear of the Ford when it failed to accelerate out of the corner, apparently out of fuel. This sent the Ford spinning sideways into the wall, and left the Corvette with significant front-end damage. Its sister car, the #4 Corvette Racing C7.R of Tommy Milner and Olivier Gavin did not pass the ailing #3 Corvette, however, meaning the two Corvette entries finished second and third and resulting in a good amount of points in their hunt for the manufacturer’s title. The #911 Porsche of Patrick Pilet and Nick Tandy, which started from pole, struggled for grip late in the going and meant the Porsche lost positions to both Corvettes in the race’s final hour. Pilet finished the race and came home in fifth. It was a quiet day for the #67 Ford GT of Ryan Briscoe and Richard Westbrook who came home in sixth, beating only the pair of BMW M8 GTEs who had struggled for pace the entire weekend. The #25 BMW M8 GTE getting the better of their teammates in the #24 BMW M8 GTE. 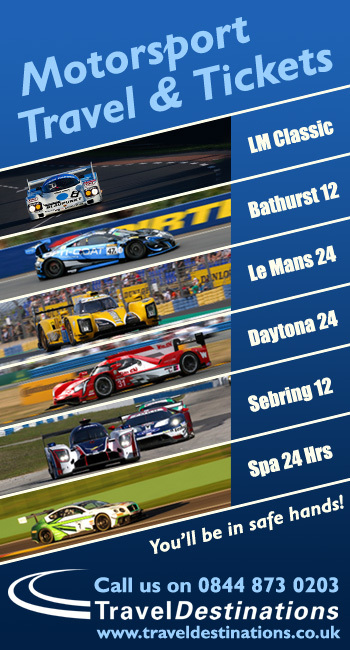 The next round of the IMSA WeatherTech Sportscar Championship is on May 3-5 from Mid-Ohio, where GT Daytona and LMP2 cars will rejoin the action.